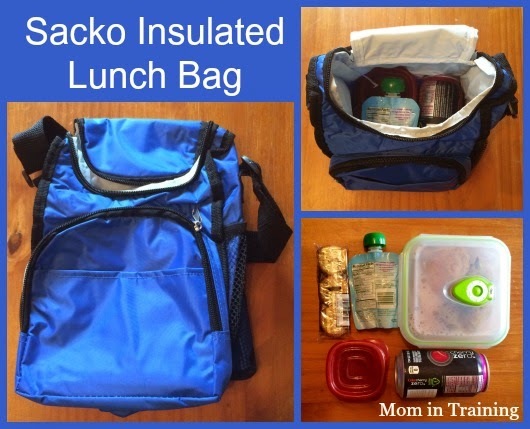 If you've ever packed a lunch whether it be for yourself or for someone else than I'm sure you've had some of the same problems I've encountered over the years. Needing more space and needing a place that's separate from the ice packs so it stays dry. That's one of the many features I love about my new Sacko Insulated Lunch Bag. It not only has a nice large main compartment, it also has side mesh pockets and a front zippered pocket. Now I have the perfect place to put my husbands silverware and napkins separate from his food! No more soggy napkins come lunch time. As you can see from the photo I was able to pack his entire lunch with lots of room leftover. Great for those days you have multiple containers you need to pack. Or for packing lunch for two even! It has a nice adjustable shoulder strap so he can carry it into work hands free. The insulation works great because his lunch stays nice and cold until he's ready to eat it. And it even wipes out nicely if you have something leak inside. This looks like a high quality lunch box! How cool! This lunch box would be great for my son in law to take to work with him! Looks like it holds a lot and keeps it well insulated.